Green Grocer: Green Grocer is a farm stand on wheels—a customized delivery truck of refrigerated, ready-to-sell perishables that stops, sets up, sells, then moves on to other locations. The goal of Green Grocer is to expand the Food Bank’s reach into communities where people lack access to fresh, nutritious foods. 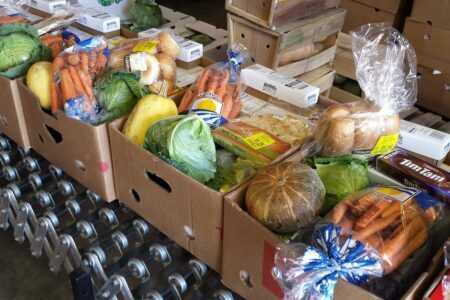 Produce to People: Our largest direct mobile distribution program, the Produce to People model provides a more accessible way for eligible people to receive free food through a dignified, high-quality process centered on the distribution of fresh and, when possible, local produce and other foods. Community Table: Through this program, we pair restaurants and commercial kitchens with our member agencies. Chefs prepare complete, nutritious meals on a scheduled basis for the agencies to distribute to people in need.